This probably will not be a surprise to many people, but "I Love Being Creative". 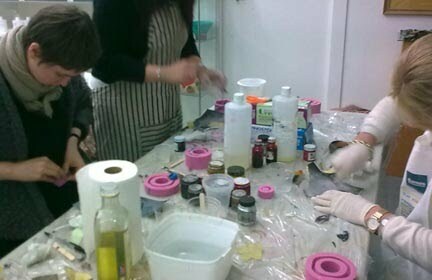 Last night I participated in a "Resin Jewellery" class. 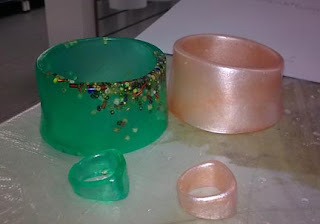 I have wanted to have a try at resin for quite a while as I have seen some really nice pieces. They were also quite expensive and I wanted to see just how much the pieces would really cost to make. There were only four students so we really got our monies worth out of the teacher. I certainly wasn't disappointed with the evening, the process was quite easy and you really don't know the result you will get until you take your masterpiece out of the mould. Now I know my pieces aren't earth shattering but I am really happy with them. Davine, these are amazing! I love the colors and it sure sounds like an interesting evening. You most certainly are creative, I could use some of that creativity right about now here in my home with all the work I'm doing!